The ‘mane’ event of the year has arrived – it’s National Unicorn Day! Unicorns are mythical creatures admired for their beautiful spiraled horns, luscious fur and pastel colouring. 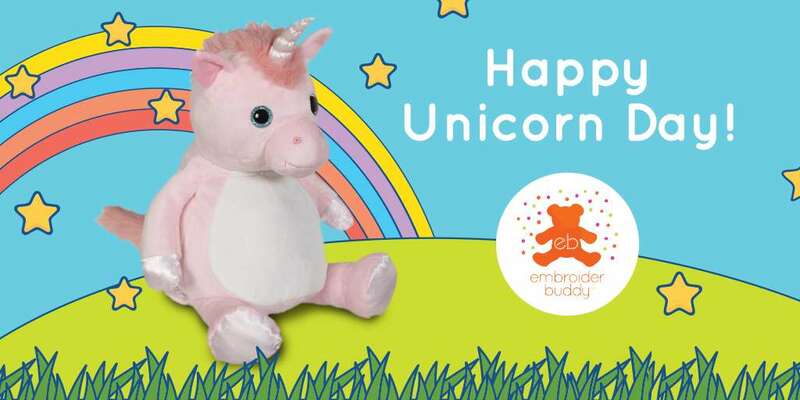 Is there a better way to celebrate National Unicorn Day with Embroider Buddy® than by showcasing our most majestic Buddies? We don’t think so! Let’s take a look at our ‘uni-fied’ trifecta! Their cotton candy pink and purple coats, fluffy manes and tails, silky paws and sparkly blue eyes make you wish unicorns were more than just a fairy tale. 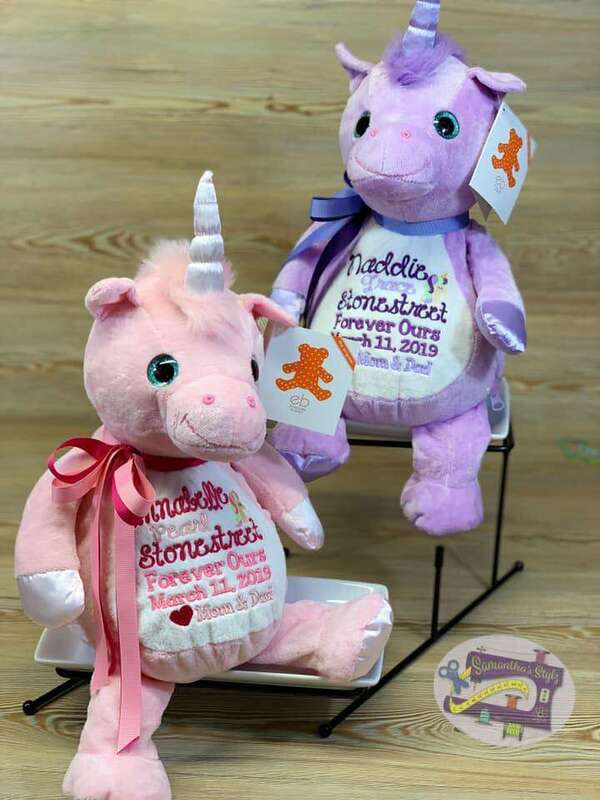 Whimsy Unicorn Buddy and Violette Unicorn Buddy symbolize love, purity and magic and are loved by both children and adults. These two are a perfect gift for siblings or best friends! 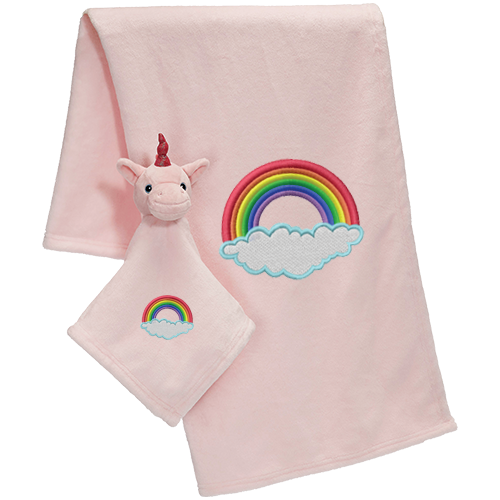 The Unicorn Blankey Buddy Set is an Embroider Buddy® favourite and is popular among embroiderers! This ultra-soft, cute, whimsical pink unicorn makes for a perfect gift and the cuddliest magical friend. The large Blankey is 30 x 40 inches and the mini Blankey is 16 inches; that’s a lot of room for your personalized designs! Both Violette and Whimsy are easy to embroider. FACT. Yes, Violette and Whimsy make embroidery a cinch. Simply remove the self-contained stuffing pods through the hidden zipper on their bottoms and fasten them to a hoop for easy machine embroidery. Unicorns have wings. FICTION Unicorns do NOT have wings. They are earthbound, like Violette and Whimsy. Whimsy and Violette are safe for children. Definitely FACT! All of our beloved Buddies are safe for children of all ages. Embroider Buddy® stuffed animals exceed all applicable U.S., Canadian, Australian and European standards. There are so many cute unicorn embroidery ideas, we couldn’t help but share! If you’re lucky enough to be different, don’t ever change! Looking for some celebratory Unicorn Day inspiration? Here are some enchanting ideas! Take a picture with Whimsy or Violette and post it on your social media pages. Add colourful food dye in your cooking and sprinkles in your baking. Wear pastel coloured clothes with some extra bling! We want to see how you’ve worked your ‘magic’ on our unicorn Buddies. Please share your creative customizations in the comment section below!